By 1776 the attitudes of the colonists towards the British continued to sour and many people started to speak publically about the need for the colony to officially break from Britain. The most logical and clear explanation of why the Americans should separate from Britain was found in a 46 page pamphlet written by Thomas Paine. Paine chose to make a short, easy to read, document that even non-educated people could understand in order to push against King George II, who he thought was a tyrant. He would claim that is was unnatural for tiny England to have control over the much larger area of America and would call on Americans to fight the British to gain their freedom. His pamphlet would eventually be printed and would sell over 100,000 copies within a few months. This amazing number of copies showed how much of an impact these ideas were having on the people of America, to the point that this was the only year in US history when any book outsold the bible. Richard Henry Lee (Virginia), but would be heavily debated for weeks afterwards. 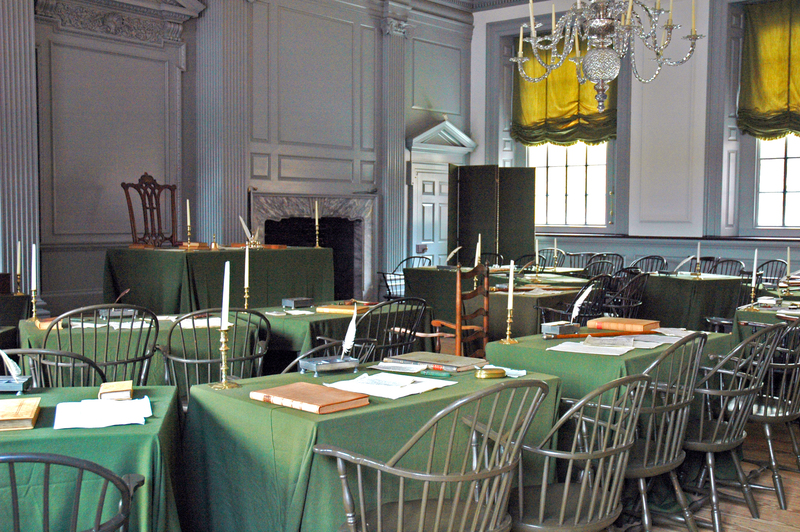 Eventually the Continental Congress decided to return to their homes to ask the people of each state to give their opinion on the cause. It was immediately clear that the majority of the people in the country were in favor of the split, so this gave the leaders more confidence to make a bold decision. Continental Congress would choose their most talented writers to develop a document that would explain their reasoning behind the break from Britain. A group that included Ben Franklin, John Adams, and Thomas Jefferson would work on a legal case to justify this split. The young Jefferson would become the scribe for the group and in this role would become known as the principal author of the document. It was clear from the very beginning that Jefferson had added many of his personal philosophical ideas to this document, many of which had been developed from recent Social Contract ideas from the Enlightenment writers. It is important to remember how radically different this document was from anything anyone had ever seen before. While Enlightenment thinking was popular, using it as a justification to create a new country is one of the most courageous acts in the history of the world, at least in terms of legal maneuvers. Unfortunately, Jefferson’s idea of speaking against slavery was removed during later conversations in large part because this would have ruined the unity of the American people, both within the Continental Congress and with the American people themselves. The group would eventually finish a draft that was kept short on purpose, and would present it to the Continental Congress. A large part of the document was simply a list of actions that King George II had done that were seen as wrong. This was done to justify their actions, not only to King George II himself, but to other countries in the hopes of getting international legitimacy. The revised Declaration would be officially presented to Congress (July 4, 1776) and would soon after be unanimously approved by the 13 States, thus created the United States of America.